Bermuda grass is always, increasingly, encroaching upon our vegetable garden. This year, we're fighting back by planting it all in tillage radish as a cover crop. The idea is that radishes grow faster than most weeds, and if you plant them close together, their broad leaves block sunshine to the ground, so new weed sprouts don't have much of a chance. It's organic weed management via strategic outcompetition. This, however, leaves us limited room to grow our food--which in turn creates the opportunity for us to get a lot more comfortable with container gardening. 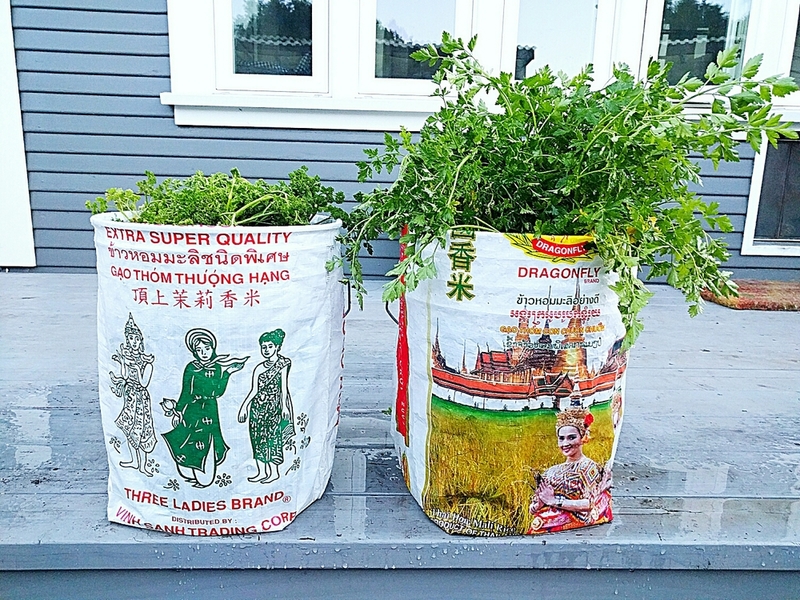 We dug up our happy parsley plants from the garden and put them in our cheery new planters, which Adam made by covering five-gallon buckets with rice sacks we'd saved. The parsley seems seem pretty happy in its new home, right?